10:08pm – The housemates have now left the arena and returned to the house. 10:06pm – This week’s Friday night PayPorte arena games have ended with Lolu winning. 8:57pm – The games begin with Tobi Bakre. 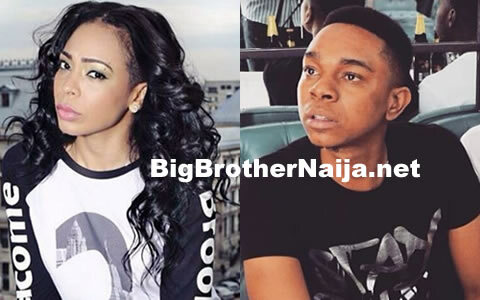 8:45pm – The housemates are in the arena for this week’s Friday Night PayPorte arena games. 4:08pm – Alex, Tobi and Rico Swavey are having a conversation inside the closet room. 4:05pm – Big Brother tells the housemates to close all the front doors of the house and remain inside until further notice. 3:15pm – Nina is giving Rico Swavey a hairdo inside the closet room. 3:13pm – Bambam and Teddy A are on their bed with Bambam massaging her man’s knee. 3:09pm – Finally the ninja exits the house after taking pictures of every housemate. 3:06pm – The ninja is now moving around the entire house taking pictures of every housemate. 3:04pm – The ninja also takes a picture of Tobi who’s sleeping on a couch in the lounge. 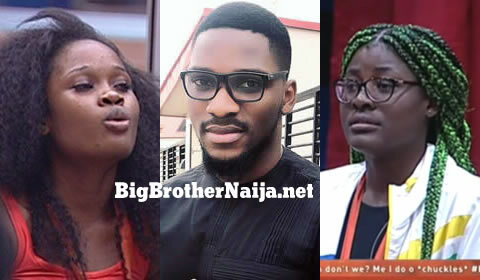 3:03pm – One of Big Brother’s ninja’s quietly enters the house with a digital camera and takes pictures of Cee-C and Miracle who are both in the lounge. 3:00pm – Miracle and Cee-C are still having their conversation in the kitchen. 2:40pm – Tobi is sleeping on a couch in the lounge. 2:27pm – Cee-C and Miracle are in the lounge having a conversation. 2:10pm – Alex is having a conversation with some of the guys in the closet room, she jokes that nobody can beat her inside the Big Brother house. 1:50pm – Rico Swavey and Alex are having a one on one conversation in the kitchen. 1:43pm – Teddy A is having a shower. 12:58pm – The housemates are enjoying Alex’s meal. 12:45pm – Alex is serving the food that she has cooked in the presence of Miracle, Tobi and Lolu are providing some bit of conversation. 12:42pm – Big Brother summons Alex to the diary room. 12:36pm – Big Brother summons Nina to the diary room. 12:28pm – Miracle joins Alex and Tobi who are in the kitchen preparing the housemates’ meal for conversation. 11:33am – Alex is in the kitchen peeling and cutting yam. 11:27am – Tobi and Alex are in the kitchen to prepare the housemates’ lunch meal. 10:56am – Big Brother tells the housemates that the front doors of the house may now be opened, they all then move inside the house. 10:30am – Cee-C, Alex and Tobi are having conversation in the garden while other housemates are just silent. 9:50am – The housemates have woken up and have moved to the garden. 9:58am – Big Brother orders the housemates to move to garden and close the front doors of the house. 9:02am – Alex is inside the bedroom dancing to Big Brother’s music. Good morning to you all and welcome to day 54 of Big Brother Nigeria 2018, follow today’s Live Feed Blog for all the latest updates. You can as well check out yesterday’s highlights Here.